Tammy’s dog Summer ate several pounds of raw hamburger, a few days later symptoms began to appear. Tammy immediately rushed her to the clinic where the veterinarian performed surgery and saved her life. A bad situation had a very happy ending, which is one reason Tammy loves the Veterinary Profession. Tammy was born in Prairie du Chien and grew up on a farm. She has always had a love and compassion for all animals. She moved to Racine with her parents, two sisters, and a brother when her father accepted a new job here. 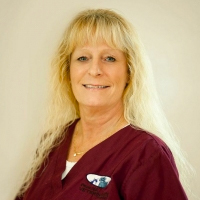 Tammy worked in the human medical field as a Dental Assistant before she decided to switch careers and work in the veterinary profession. She is able to work at a job she loves every day. She enjoys spoiling our patients by giving them treats and sharing her affection for them. Tammy raised two sons, who both love dogs too. Rounding out the family is Summer, her Norwegian Elkhound Mix. Summer was a handful the first two years of her life. She especially enjoyed eating household belongings and of course raw hamburger.